Designed by Regitze Overgaard, the Sphere bangle is inspired by magical crystal balls and inspire thoughts of the future. This piece's simplistic elegance makes it beautiful for everyday wear. Compliment this piece with our Georg Jensen Savannah Rock Crystal dangle earrings or Georg Jensen Offspring Pendant necklace. From its founding by Georg Jensen in 1904 to its present guidance by CEO Francesco Pesci, Georg Jensen has produced elegant jewellery in serene designs. Each piece is creatively inspired, echoing Georg Jensen’s focus on timeless aesthetic & functional beauty. As a company, Georg Jensen is publicly committed to CSR & has joined the UN Global Compact. Georg Jensen puts forth a continuous effort to increase emphasis on human rights, labour rights, environmental protection, & the struggle against corruption. 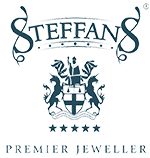 Steffans is one of the leading official UK stockists and can provide the full Georg Jensen range. We bring you the latest collections, providing an opulent range of diamond rings, bangles, bracelets, earrings, cufflinks, necklaces, & pendants to choose from. Prices in store range from £110 - £7450, featuring choice pieces that transcend trends with graceful luxury. All Georg Jensen items are packaged in branded packaging with a 1 year warranty.